In this addition to my price action course, we’re going back to the three-candle patterns. 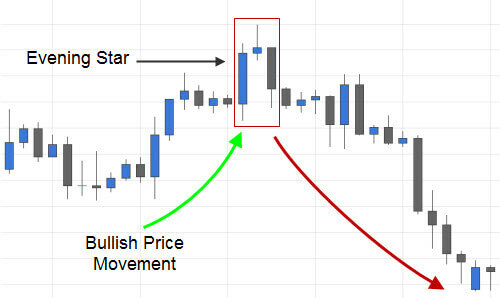 Correctly identifying and trading the evening star candlestick pattern can be very rewarding. In this article, I’m going to show you the right way to trade this profitable candlestick signal. 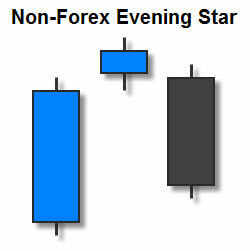 The evening star is considered to be a strong reversal signal. Like all strong bearish candlestick patterns, the evening star is not only profitable to trade, but is also very useful in identifying important resistance levels. This pattern is one of the first candlestick signals that I learned how to trade, and it, along with the morning star candlestick pattern, continues to be one of my favorites. However, these patterns do not occur as often as some of the other strong reversal signals, i.e., engulfing patterns, hammers, and shooting stars. What is an Evening Star Candlestick Pattern? 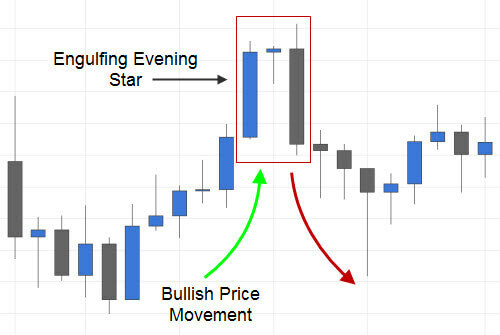 An evening star candlestick pattern is a strong bearish reversal signal, meaning a true evening star pattern only occurs after an uptrend in price. What constitutes an uptrend in price may vary from trader to trader, but the move should be somewhat significant. Steve Nison has stated that a trend in price, as it relates to candlestick trading, may be as little as a few significant candles in one direction. 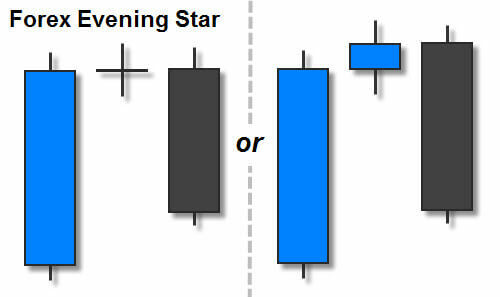 The evening star candlestick pattern consists of a relatively large bullish candlestick, followed by a candlestick with a relatively small real body (like a doji or spinning top), followed by a bearish candlestick that closes somewhere lower than the 50% mark of the first, bullish candlestick’s real body. Note: In Forex, if the second candlestick in this three-candle pattern is a spinning top or something slightly larger, it must be bullish (see the image above). A non-Forex evening star is similar. One difference is that the second candlestick needs to be isolated above the first and third candle of this three-candle pattern. There should be, at least, a small gap up to the second candle, and also another gap back down to the third candle (see the image to the right). Like in the Forex pattern, the second candlestick should have a relatively small real body (like a doji or spinning top), but unlike the Forex pattern, the second candlestick could be either bearish or bullish, as long as it is isolated above the first and third candles. Lastly, a non-Forex evening star’s third candlestick does not necessarily have to open at or above the first candle in the pattern. It could simply gap back down from the second candlestick into the real body of the first candle, and close somewhere below the 50% mark of the first, bullish candlestick. Note: Sometimes you will see a Forex evening star pattern that looks like its non-Forex counterpart (leaving the second candlestick isolated above the others). These occurrences of the pattern don’t happen often in the Forex market, but when they do, it is usually a very strong bearish signal. In the image below, you will see a textbook evening star candlestick pattern. This one would have worked out very well for any trader that took the signal – even at the traditional entry (when price breaks the low of the third candlestick). Given the context in which this pattern occurred, as well as the high wick of the second candlestick, and the low wick of the third candlestick in this pattern, I would have considered entering this trade on the open of the next candlestick. By doing so, you could slightly raise your potential risk to reward on this trade. In the next example (below), you will see an evening star signal who’s third candlestick engulfs the first and second candlestick in the pattern. This is a high probability signal, although it usually does not make for a very good risk to reward scenario. In my previous article, Trading the Morning Star Candlestick Pattern, I mentioned that I prefer to wait for a pullback on signals that have an engulfing third candle. That’s exactly how I would have played the signal below. By waiting for a pullback in price to the 50% mark of the large, third candlestick in this pattern, you either create a more favorable risk to reward scenario, or you avoid the trade altogether. In our example below, we would have stayed out of the trade using this technique. Note: This pullback to the 50% area of the third candle in the pattern does not happen every time, or even most of the time. This technique is simply a way to create a more favorable risk to reward scenario on a trade that you would otherwise avoid. In the next example (below), you will see another evening star signal. Although this pattern would have worked out, there are a few things to consider. A discerning trader may have stayed out of this one. First, the tall wicks or shadows on top of the three candles in this pattern necessarily lower your risk to reward potential, because your stop loss needs to be placed above the highest high in the sequence. However, the tall upper wicks are a bearish indication. The second thing that I would mention is that the real bodies of the candlesticks in this pattern aren’t relatively large. In the previous two examples, the real bodies of the first candlestick in each pattern are the largest in their respective uptrends. This is not a requirement, but it is something that you might want to consider. Larger candlesticks are more significant in any price action pattern. All that being said, I still would have take the trade above. I would have taken the traditional entry (show in the image above), and I would have closed half of my position as soon as the trade reached 1:1 risk to reward – leaving the other half in the market. After seeing that harami pattern at the bottom of the move, I would have closed the rest of the trade for a decent profit. As with any bearish reversal signal, a true evening star will only occur after a uptrend in price. Trying to trade similar candlestick formations during periods of price consolidation is not wise. In the Forex market, remember that the second candlestick in this pattern must be a doji or a small bullish candlestick. In other markets, the second candlestick can be bullish or bearish, as long as it is isolated above the other two candles in this pattern. The third candlestick in this pattern needs to pull into and close, at least, somewhere lower than the 50% mark of the first, bullish candlestick. Often, the third candlestick in this pattern will engulf the previous two candlesticks or more. When that happens, it is a strong bearish signal, although it necessarily creates a less favorable risk to reward scenario. Steve Nison recommends trading candlestick patterns using western technical indicators, although many price action traders do well with pure naked charts. I prefer to trade candlestick patterns in addition to my main trading system, which helps me qualify the best candlestick signals to take. 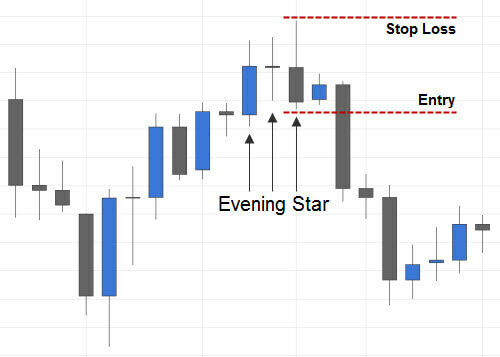 Trading the evening star candlestick pattern can be very rewarding, if it is done right. No trader is an expert at this pattern after simply learning to identify it. It takes practice to get a feel for what techniques need to be used and when. Be sure to demo trade this profitable candlestick signal before risking your hard earned money, and it just might become one of your favorite candlestick signals too.